Just one day is left until the big day. I had decided to write few topics related to the completion of first year of blogging. This is just another topic under the 'Anniversary Special'. Blogging, TPCG for that matter, has made a lot of impact on me. I was definitely something different from what I am today. I have to make sure that I am what I speak on the blog. For example, if the room is untidy while doing a project, or if my closet is messy, I keep reminding myself that I am a blogger who writes about organization, and that I must stick to what I write. Maybe, keeping house organized is not open in public, but still I believe it needs to be organized. But as I am always writing blog-posts or doing some assignment or the other, it makes harder to organize things in my room. However, I must get up once a while, and clean at least few 'bad' stuff. Well as in, a messy room is always a turn off. The room's condition is not public, but the way I carry myself to college or elsewhere is definitely public. Though people on the streets don't know that I am a blogger, the students in my college definitely do. So I don't know why, but I constantly feel that people are observing me. I have this crazy notion that people observe me wherever I go. So to support my notion, I must be near to perfection to give people (who I think observe me) a better opinion about me and my blog. Though I don't look the best of the girls in the college, I definitely try my best (of course not to look best, but nerdy). So this makes a difference in what I wear. Though I am mostly dressed in a pair of jeans or a loose t-shirt, with not-so-good hair most of the days, on few days I look good (or at least I think I do!). So blogging makes me worried about my looks, because I think people are judging me because of what I write and if it matches with how I carry myself. Another difference is the color pink, or for that matter, the pastel shades. I used to like a bit of pink with lot of black. However, with TPCG, as there's everything in either of the pastel shades, it makes me hate these colors sometimes. It becomes an overdose of these colors. I don't like to be overly feminine. Therefore, it just is annoying at times. The best change in me is the feeling of having something to say proudly about. When people talk about how unsuccessful we are at this point in time, I smile, because I know I am successful. Though TPCG is not really famous, I am successful, because I have achieved something through it. 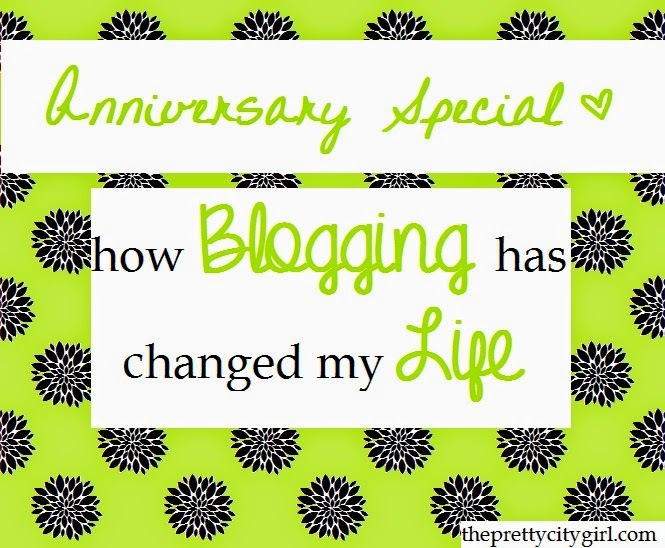 I am proud of myself for writing the blog for a year. I had never thought I would be someone who writes, because I wasn't a 'writer' in school. Writing essays would be a tough task back then. Also a funny thing is my interest in accessories and different colored nail polishes. I was never interested in wearing all this, but now I do. I am slowly developing interest in bracelets and colorful nail polishes. However, I haven't thought of wearing them casually, but only on special occasions. Another funny thing is the way people address me now: It is always like, "Hey Pretty City Girl!" Feels good. Last but not the least: I am much more creative and crafty than I was in my school. It is fun to make different things and then uploading tutorials explaining them on the blog. I have so many DIY projects in my room. TPCG is so much to me. It has taught me a lot. It supports me during my tough times. It gives me ideas. It gives me something to be proud about.